Limb Girdle Muscular Dystrophy (LGMD)- Market Insights, Epidemiology and Market Forecast | Market Research Reports® Inc.
Limb Girdle Muscular Dystrophy (LGMD)- Market Insights, Epidemiology and Market Forecast report is published on April 16, 2019 and has 100 pages in it. This market research report provides information about Drug Pipeline, Research & Development (Pharma & Healthcare), Drug Discovery, Pharma & Healthcare industry. It covers Global regional market data and forecasts. It is priced starting at USD 6,250.00 for Single User License (PDF) which allows one person to use this report. Limb Girdle Muscular Dystrophy (LGMD)-Market Insights, Epidemiology and Market Forecast-2028’ report delivers an in-depth understanding of the disease, historical & forecasted epidemiology as well as the market trends of Limb Girdle Muscular Dystrophy (LGMD) in the United States, EU5 (Germany, Spain, Italy, France and United Kingdom) and Japan. According to DelveInsight, the market of Limb Girdle Muscular Dystrophy (LGMD) in 7MM is expected to change from the study period 2017-2028. • To understand the future market competition in the Limb Girdle Muscular Dystrophy (LGMD) market. “Ventricular Dysfunction - Market Insights, Epidemiology and Market Forecast – 2028” report provides the detailed overview of the disease and in depth understanding of historical and forecasted epidemiology. It highlights the existing treatment patterns, potential upcoming drugs and also identifies best of the market opportunities by providing the current and forecasted market revenue, sales trends, and drug uptake during the study period from 2017-2028. “Gliosarcoma - Market Insights, Epidemiology and Market Forecast – 2028” report provides the detailed overview of the disease and in depth understanding of historical and forecasted epidemiology. It highlights the existing treatment patterns, potential upcoming drugs and also identifies best of the market opportunities by providing the current and forecasted market revenue, sales trends, and drug uptake during the study period from 2017-2028. “Onychomycosis - Market Insights, Epidemiology and Market Forecast – 2028” report provides the detailed overview of the disease and in depth understanding of historical and forecasted epidemiology. It highlights the existing treatment patterns, potential upcoming drugs and also identifies best of the market opportunities by providing the current and forecasted market revenue, sales trends, and drug uptake during the study period from 2017-2028. “Bone Neoplasms - Market Insights, Epidemiology and Market Forecast – 2028” report provides the detailed overview of the disease and in depth understanding of historical and forecasted epidemiology. It highlights the existing treatment patterns, potential upcoming drugs and also identifies best of the market opportunities by providing the current and forecasted market revenue, sales trends, and drug uptake during the study period from 2017-2028. “Mastocytosis - Market Insights, Epidemiology and Market Forecast – 2028” report provides the detailed overview of the disease and in depth understanding of historical and forecasted epidemiology. 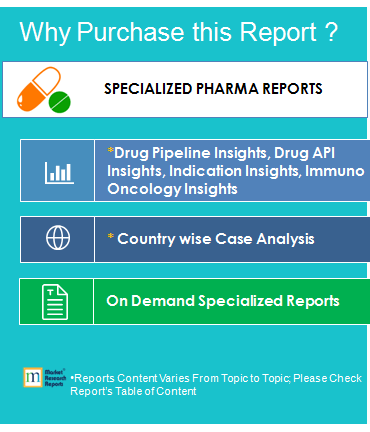 It highlights the existing treatment patterns, potential upcoming drugs and also identifies best of the market opportunities by providing the current and forecasted market revenue, sales trends, and drug uptake during the study period from 2017-2028.